All transactions are safe and secure with a reliable history in online purchasing behind each of our associates. 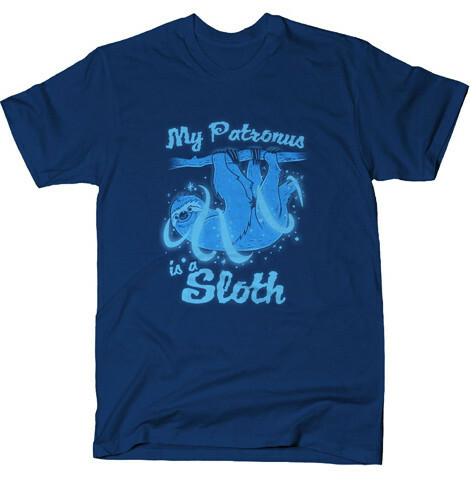 Buy the My Patronus is a Sloth Harry Potter t-shirts to own Harry Potter clothing and merchandise. Let everyone know that your patronus is a sloth. It's why you're a bit lazy and show up late for meetings of Dumbledore's Army, the secret Defense Against the Dark Arts group from the Harry Potter books. Pair it with an "I Love Harry Potter" tee shirt. Harry is the one who teaches members of Dumbledore's Army how to defend against the Dark Arts. This T will let your friends know that you have a patronus too, just like "The Boy Who Lived" - the child who survived Voldemort. This Hogwarts School of Witchcraft and Wizardry tee is perfect wizard merchandise for any aspiring member of Dumbledore's Army or any J.K. Rowling Potterhead. In addition to the My Patronus is a Sloth Harry Potter tees above, browse the Harry Potter Clothing Gallery for more apparel like men's and women's clothes, kids shirts or hoodies.